The structure of the TM1585 gene of the bacterium Thermatoga maritima, recently solved by the Joint Center for Structural Genomics, gives the first look at a novel enzyme in sugar metabolism, and provides a new protein fold as a bonus. Polysaccharides provide a source of energy and carbon for growth in most organisms. Typically, polysaccharides are broken into individual sugars outside the cell, and then more completely degraded inside the cell. Based on the current needs of the cell, different pathways may be used to break down sugars. Glycolysis is the central pathway, but several alternative pathways are also active. All eventually create pyruvate, but they get there different ways. Glycerate kinase is the last step in the non-phosphorylative Entner-Doudoroff pathway, a pathway that starts with glucose and ends with 2-phosphoglycerate. This pathway is particularly interesting because it is thought to have evolved before glycolysis, and thus represents a view of metabolism in very ancient organisms. Glycerate kinase is composed of two domains. The larger domain is a typical Rossmann-type fold and probably binds to the ATP needed for the phosphorylation reaction. The smaller domain is a new fold discovered in this structure. Use the buttons below to switch between a ribbon representation, which shows the folding of the chain, and a spacefilling representation, which shows the size and shape of the cleft that performs the reaction. As with other kinases, the structure of glycerate kinase shows a monomeric protein with two large domains. The N-terminal domain (at the top here) is a typical Rossmann-type fold, and is expected to contain the binding site for ATP. The substrate glycerate is expected to bind in the cleft, allowing the enzyme to close around it when performing the phosphorylation reaction. Both domains are alpha-beta-alpha sandwiches, with a beta sheet (in yellow) surrounded by alpha helices (in magenta). However, the C-terminal domain (at the bottom) has a new arrangement of alpha helices around the central beta-sheet, never seen before in other protein structures. 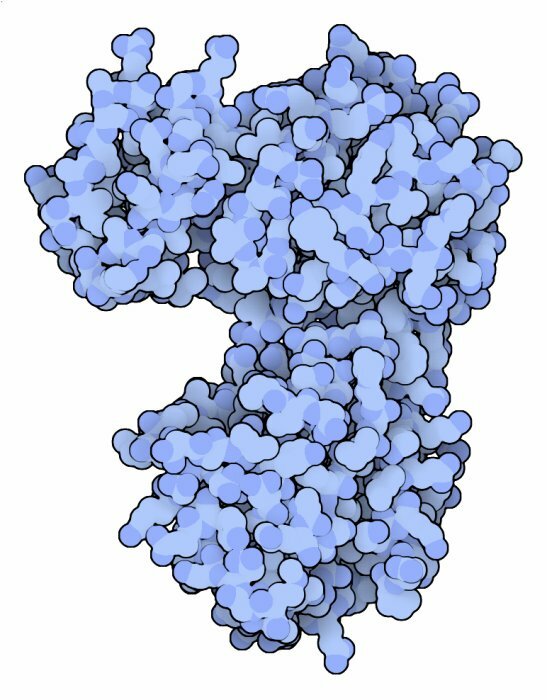 One of the major goals of the PSI project is to discover new protein folds like this one, to provide a more comprehensive database for future efforts in structure analysis and fold prediction. 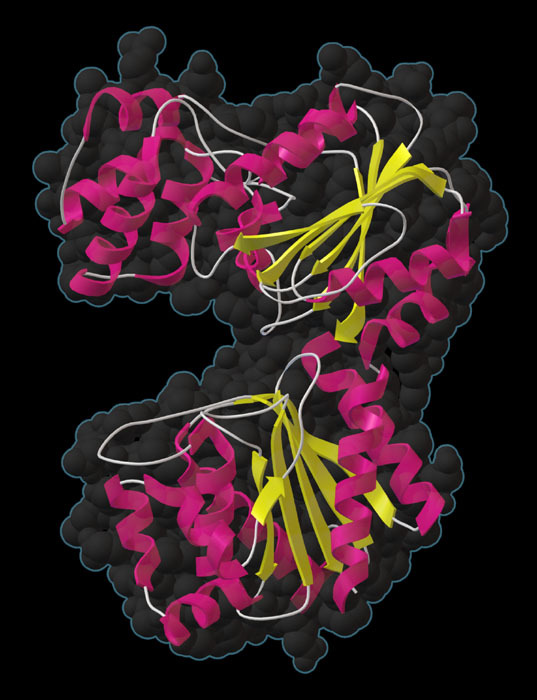 The JCSG structure of glycerate kinase is available at the Protein Data Bank in entry 2b8n. The illustration was created with the Python Molecular Viewer. Schwarzenbacher R, McMullan D, Krishna SS, Xu Q, Miller MD, Canaves JM, Elsliger MA, Floyd R, Grzechnik SK, Jaroszewski L, Klock HE, Koesema E, Kovarik JS, Kreusch A, Kuhn P, McPhillips TM, Morse AT, Quijano K, Spraggon G, Stevens RC, van den Bedem H, Wolf G, Hodgson KO, Wooley J, Deacon AM, Godzik A, Lesley SA, Wilson IA. (2006) Crystal structure of a glycerate kinase (TM1585) from Thermotoga maritima at 2.70 A resolution reveals a new fold. Proteins 65, 243-248. Peekhaus N, Conway T (1998) What's for dinner? : Entner-Doudoroff metabolism in Escherichia coli. Journal of Bacteriology 180, 3495-3502.